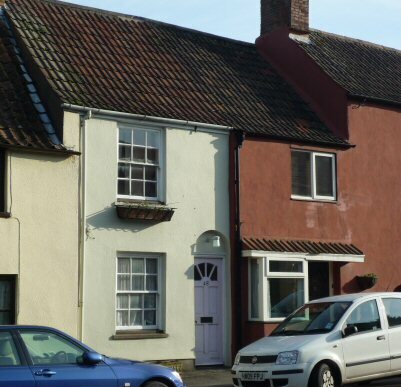 At this stage we know little about the history of the house that is now 48 Castle Street in Thornbury before the Tithe Survey that was begun in 1837 and was completed in 1840. To understand the history of the house it is necessary to look closely at the photograph on the left hand side. Number 48 is the light coloured little house on the second left with a pale pink front door. It shares the roof line of part of the neighbouring house number 46. The front door of number 46 is behind the car in the photograph. Number 46 has an unusual roof line and it appears to share part of the neighbouring property number 44. It is obvious from this that the three houses that are now 48, 46 and 44 Castle Street share some of their history and it seems very likely that the boundaries of the properties have changed, probably more than once. It is possible that number 48 and 46 were once one property which was divided into two homes. We do know that number 48 was given the number 287 in the Tithe Map, which was drawn up between 1837 and 1840. The accompanying apportionment shows that the house belonged to Thomas Gwynn and was occupied by James Councell. Number 48 Castle Street was only owned by two families, the Gwynns and then the Lloyds, until at least 1925. We have not seen the deeds and so we do not know when it became owned by its occupants. John Crowther Gwynn. The three properties could not have been sold in 1899. In 1900 on September 5th John Crowther Gwynn appears in the records of Thornbury Manor Court. 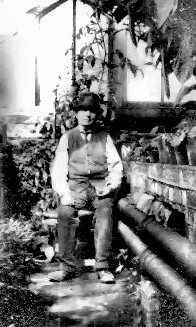 He was liable to a fine of two years value on his admittance as trustee of the will of Thomas Gwynn now deceased for three copyhold cottages in Castle Street Thornbury on death of Lieutenant R A Gwynn. These were said to be numbers 286 and 287 in the Tithe Apportionment. The fine he had to pay to become the effective owner of these properties was £27.10. Read about John Crowther Gwynn. Henry Hume Lloyd The records of Thornbury Manor Court show that the properties were bought by Henry Hume Lloyd about 1903. On October 14th 1903 he had to pay a fine to become the owner of three copyhold messuages and gardens in Castle Street on their surrender by John Crowther Gwynn and his wife. They were described as numbers 286, a house and garden and 287 two houses with gardens. Read about Henry Hume Lloyd. Alice Lloyd. In 1904 on May 11th Alice Lloyd paid a fine of a half year’s value on her admittance on the death of her husband Henry Hume Lloyd for the three cottages in Castle Street. Read about Alice Lloyd. James Councell was 77 years old when he was buried in St Mary’s churchyard on 23rd May 1845. Susannah was buried on 29th April 1846 aged 78. William Smith Bailey. The 1851 census shows the next occupant was William Bailey aged 44 a master cordwainer and his wife Jane aged 37. William Smith Bailey had married Jane Hughes in Bristol in 1839. The 1859 rate book shows that it was still a Thomas Gwynn property but occupied by William Bailey. William was born in Thornbury in 27th April 1806 and he was the son of William and Celia Bailey. “William Bayley” the elder had married Celia Smith on 17th April 1804 in Thornbury. On 5h July 1809 William’s father aged only 30 was buried in Thornbury. We know this because of the record of the baptism of Eliza Bailey, William’s sister, shows that her father was deceased at the time of her baptism. The record says that William senior had been a labourer. William’s sister Eliza seems to have lived with her mother Celia, who later married James Downes a farmer in Moreton. In the 1841 census Eliza was living in Moreton with the Downes family. Eliza died in 1845 aged only 36. This seems to imply that William was brought up by Thomas Richards, and his wife. It appears that William married in Bristol in 1839. However a Morton connection appears to have continued as their first son William Hughes Bailey was baptised in Thornbury on 13th September 1840, at which time the family home was said to be in Moreton. In the census of 1841 William was living in Duckhole in Lower Morton near Thornbury in 1841 with his wife Jane and son William aged ten months. By the time their second son, Henry James Bailey was baptised on 19th October 1842 the family home was said to be Thornbury. We do not know if this implies they had moved by this time as the records are often rather vague about residence. Fanny Emily Bailey was baptised on 7th January 1846. Thomas Smith Bailey was baptised 21st July 1847. Lucy Jane Bailey was baptised 12th December 1849. Walter Newton Bailey was baptised 21 April 1852 and finally Ada on 16th May 1860. Four of their children died between 1851 and 1854. The 1861 census shows that the remainder of the family of William Smith Bailey (then aged 54 a boot and shoe maker) and his wife Jane were still living in 48 Castle Street. Henry James Bailey aged 18 was a pupil teacher. Thomas Smith Bailey aged 13 was a scholar and little Ada was aged only two. The 1871 census shows that William Smith Bailey continued to live in the house with his wife Jane and 12 year old daughter Ada. William was 64 years old and still working as a cordwainer and Jane was 56. The two older boys had left home. The trade directories showed that William Smith Bailey was a boot and shoe maker in Thornbury until at least 1877. William’s wife Jane died on April 17th 1878 aged 63. She was buried in Thornbury. By 1881 the census shows the widowed William Smith Bailey was living in Stonehouse in Devon with his son Henry Bailey, then aged 38. William Smith Bailey died April 15th 1881 aged 74 and he was interred in Plymouth Cemetery. Thomas Smith Bailey – became a schoolmaster. The 1871 census shows that he was living in Cornwall in a village called St Stephen in Brannel. He was lodging with a farmer John Smith and his wife Catherine. The 1881 census shows that he was living in Cornwall aged 33 with his wife Mary aged 32 and their daughter Elizabeth aged 4. The 1901 census shows that Thomas and Mary went to live in Plymouth in Devon. Henry James Bailey – by 1871 Henry had become a certificated teacher. The 1871 census shows that he was a boarder in East Stonehouse in Devon, living with John and Ann King. John King was a Greenwich pensioner. John’s stepdaughter Elizabeth Knight was a certificated teacher aged 25 who was born in Stonehouse. The household did not seem a prosperous one. Ann King aged 59 and her granddaughter Mary aged 16 were laundresses. Henry Bailey married Elizabeth Knight in Plymouth in 1873. Henry and his wife may have begun their joint teaching careers in Bristol as the records of St Mary’s Church in Thornbury show the death of an infant, Henry John Smith Bailey who was buried in Thornbury on 21st November 1874 but living in St Phillip’s School in Bristol at the time of his death. The 1881 census shows that Henry and Elizabeth were still living in Stonehouse, Devon and both were still teachers there. They had an extensive household, in addition to Henry’s father, they had four young children with them: William Bailey’s daughter Ada who was helping her brother Henry in the school, Ann King (Henry’s mother in law) and Mary King (who may have been a sister of Elizabeth Bailey). These last two ladies also seemed to be assistant teachers. Fanny Emily Bailey died 15th January 1851 aged six. Walter Newton Bailey died 27th January 1853 aged ten months. Lucy Jane Bailey died 6th February 1853 aged three years. William Hughes Bailey died 29th April 1854 aged 13 years. George Power. The 1881 census shows that the house that is now 48 Castle Street was occupied by a groom called George Power then aged 34 who was born in New Passage, Henbury. He and his wife Mary, who was from Tytherington, had four children at this time; Charles aged six, Thomas aged five, Lucy aged four and Emily aged one. George Power was the son of Charles Augustus Power and his wife Grace (nee England). George was baptised at Northwick on 10th June 1849. In the 1851 census George was aged one year and living with his parents and his older brother Charles. In 1856 George’s father died at Olveston. By 1861 George was living with his widowed mother Grace who was working as a charwoman. George aged only 11 was already employed as an errand boy. In 1871 George Power was living with his mother and stepfather Samuel Sims at what we believe was 35 St Mary Street. George married Mary Skuse the daughter of Thomas Skuse on 29th March 1873 at St Mary’s Church in Thornbury. Initially the couple must have lived at Crossways as this was the family’s address when their son Charles was baptised on 20th September 1874. At that time Charles was said to be a labourer but by the baptism of Thomas on 1st July 1876 they had moved to Kington and George had become a groom. The baptism record of Lucy Florence Power shows that the family still lived in Kington and George was described as a coachman. By the baptism of Emily on 10th September 1879 they had moved into Thornbury. In 1880 the Rate Books showed that George Power lived at what became known as 2 Sawmill Lane. We know that the family had moved to 48 Castle Street by 1881 because the census shows George and Mary Power with four children, Charles aged six, Thomas aged five , Lucy aged four and Emily aged one. Another daughter, Ella, was baptised on 5th October 1881. The 1890 rate book shows that George and his family had moved to a much larger house at 44 Castle Street and this appears to be confirmed in the 1891 census. This census shows that three children, Tom, Emmie and Ella, were in the house and that Tom aged 15 had become a groom like his father. Their son Charles had also become a groom but he was living in Esher in Surrey in the household of a solicitor. On the right we have a photograph of George Power in the greenhouse in what was ‘Hume House’ but which later became Fairfield House. George and Mary’s son Thomas Power went to live in Horfield where he was a groom. He married a Thornbury girl Jane Catherine Roberts, the daughter of Richard Roberts in the church of St Mary in Thornbury on 29th November 1898. The 1901 census shows that George aged 51 and Mary aged 58 were living in 44 Castle Street, with two of their children; Charles aged 27 who was still a groom but who had returned to live at home and Ella who did not appear to work. In 1909 their daughter Lucy Power married William Thomas Burman in Thornbury and the youngest, Ella Power, married Edgar Cole in 1911. The 1911 census shows that the couple lived alone in the house in Castle Street. By that time George was 61 years old but still working as a gardener, presumably at Hume House. Mary Power died April 25th 1915 aged 73. George Power died August 18th 1928 aged 79. The notice of George’s funeral says that it was attended by his sons Charles and Thomas and their wives and his daughter Mrs Burnham (or Burman) and her husband. Miss Lloyd and Miss Commeline were at the funeral and flowers were sent by the staff of Hume House and by the family of the late H H Lloyd. George had been a groom for Henry Hume Lloyd and was also the gardener. Frank Jefferies. The 1911 census shows that Frank Jefferies aged 33 and his wife Frances lived in 48 Castle Street. Frank was a coachman from Rudgeway. They had been married six years and had three children; William, an adopted son, aged nine, Kathleen aged five and Donald aged three. They lived in four rooms. Frank Jefferies and Frances Stanley were married in the December quarter of 1905 in Keynsham. Kathleen Beatrice’s birth was registered in Bristol in 1905. The birth of Donald Frank Jefferies was born in Bristol on 28th November 1907. We do not believe that this family lived here for very long. The records of the National School show that Kathleen and Donald Jefferies were enrolled in the school in 1911. That record shows they were withdrawn from the school the following year and the notes say “gone to Bristol”. Donald Jefferies at least appeared to return to Thornbury and re-entered into the school in 1914 when his address was given C/O Mrs Wilcox of Parks Lodge. He again returned to Bristol and was readmitted to the National School for two weeks in 1916. We have no records to show whether Donald came on his own for holidays or whether the family returned. The parents were not listed in the Prewett’s Directories of 1914, 1915 or 1916 nor in the electoral roll for 1918. Sidney Robert and Daisy Maud Hawker. From 1925 to 1965 electoral registers show Sidney Robert and Daisy Maud Hawker lived in Castle Street. The 1925 Valuation List confirms that they occupied this house and that it was owned by Alice Lloyd. In 1950 they were sharing the house with Alice Magdalene Hawker. The birth of Sidney Robert Hawker was registered in Thornbury in 1887, although the record of his baptism on January 5th 1887 shows that the family actually lived in Clapton , near Berkeley. He was the son of Frank and Elizabeth Hawker who lived in Kington Lodge in the 1901 census. The family had moved there from Bevington where they had lived in the 1891 census. The National School records show they moved in 1899 when Sidney’s sisters, Elizabeth Emily, Evelyn Annie and Millicent Jane, started at the school. Their address was Kington at that time. They all left school in 1905. The reason given was that had left town. Sidney appears to have served in the navy in the First World War. His marriage certificate shows that he was a Petty Officer in the Royal Navy. A newspaper report mentions he was on HMS Cornwall. His naval record shows that he was actually in the navy from 1905 when he was at Vivid II an on shore training centre until 30th June 1906. His career included service aboard the Cornwallis in 1906 and 1917, the Mars in 1908, the Hannibal and the Vanguard in 1910 and the Revenge in 1917. His naval record appears to extend until at least 1927 and he was Chief Stoker when he left the navy. The register compiled in 1939 in the advent of war shows that although he was an a Royal Navy Pensioner at that time, he was again called up for service. Sidney and Daisy’s children were Ethel Hawker born on 16th October 1918, James Hawker born on 2nd December 1919 and Jeffrey on 11th September 1922. Ethel started at St Mary’s School in 1923 and James in 1924 but they both left to go to the Council School in 1925. Jeffrey started the Council School in 1928. Ethel left school in 1932 to start work followed by James in 1933 and Jeffrey in 1936. On 2nd March 1935 this property and the two neighbouring properties ( later 44 and 46 Castle Street) were advertised for sale in the Western Daily Press. This house was said to be in the occupation of “Mrs Hawker.” We cannot explain this as Sidney Hawker did not die until 1965. He died on 21 May 1965 at Thornbury hospital. Daisy died in 1966. James Hawker was an aircraft fitter’s clerk. He died in Weston super Mare in 1990. Ethel Hawker married Walter Allen in 1946. The 1975 electoral register shows that 48 Castle Street was occupied by Cyril and Pamela Marder. The 1980 electoral register shows that 48 Castle Street was occupied by Janet and Mary Jones.